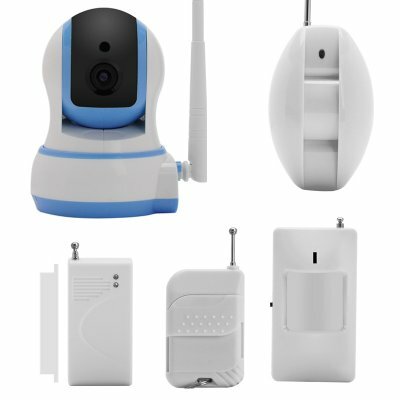 Successfully Added Wi-Fi IP Camera + Home Alarm System - 1/4 Inch Pan Tilt Camera, 2x Door Sensor, 2 x PIR, Android + iOS App, Remote Controlls to your Shopping Cart. Protect your home, work or office with this wireless smart home security kit inducing, IP camera 2 PIR sensors, 2 Door sensor and remote controls there's enough here to keep an eye on anything you. Always know what's happening 24/ 7 as this all-in-one home security system can be monitored from your Smartphone or browser and sends intelligent alerts to your phone no matter where you are. With HD video and two way audio you can remotely communicate to people on site and motion activated alarms and recording will capture any unwelcomed visitors. Use the two door & window sensors to determine if anyone enters the building. Working wirelessly up to 200 ft away from the main camera control unit these sensors can be placed almost anywhere around the home and require no wiring as they run for up to 1 year on replaceable 23A 12volt batteries. When movement is detected by the IP camera then you will be notified by an Email notifications or FTP uploads and get a snapshot of what the camera has seen, the events can also be record to Micro SD Card should you need them for later. With the ability to pan 350 degrees and tilt 90 degrees this camera can cover a large area. You can even check into on pets or chat to loved ones as there is a two way audio function built into the camera. You can cover whole rooms with the body detection PIR sensor's wide angle view or use the curtain PIR to cover entrances and hallways, as its narrow beam angles perfectly from floor to ceiling, great for exit and entrants points. This smart home security system comes with a 12 months warranty, brought to you by the leader in electronic devices as well as wholesale home security systems..